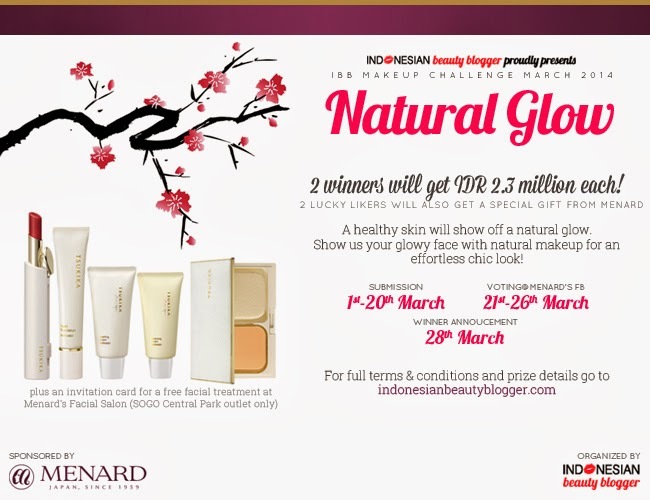 First of all I would like to say thank you to Indonesian Beauty Blogger admin who allowed me to join this March Make Up Challenge. As you know, I joined last January Make Up Challenge and I was one of the winner :'D so happy~ as usual, once you win a Make Up Challenge from IBB, you can't join their Make Up Challenge for next three months. But, because this Make Up Challenge is so special (it's IBB's anniversary!) the admin allowed me to join this March Make Up Challenge. The theme for this month Make Up Challenge is 'Natural Glow', I think it was not that easy to show natural glow, it was quite tricky. Tricky in showing the glow from the make up and also tricky in posing to show the glow that I've created. So, here you go, I made two looks for this challenge. Today is the last day to submit your look for this month Make Up Challenge. Yeeeeeay.. Look Ke duaaaa Dhillaaaaa.. syuuuka yang itu.. semangat.. semangat..